I absolutely love marzipan. So when I read that there would be a locally made almond paste available at the San Francisco Ferry Building Farmer's Market this past weekend, I made it my mission to find out exactly where. An enquiry at the CUESA.org stand pointed me in the direction of Alfieri where, sure enough, they have started making and selling almond paste. What's better still (from the pov of the taste buds on my tongue) or worse (from the point of view of my belly and hips) is that Alfieri has also started selling chocolate covered marzipan nuggets. 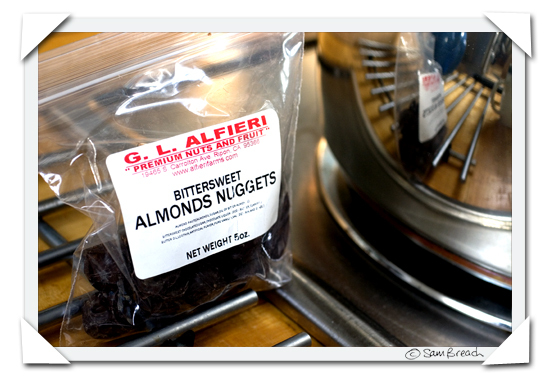 Alfieri's almond paste is on the very sweet side, but what is there not to love about sweet? Sweet is sweet, right? PS - the other sweet thing happening is that in a few hours my mUm arrives for her first visit to San Francisco in five years. I am counting down the hours. We have some stellar meals and food adventures planned, South of the City, North of the City, East of the City and in the City itself. I can't wait. Don't expect to hear a peep out of me til after she's gone back home to Blighty. I'm so tempted to hop on a plane and join you all. Have fun. marzipan is enidd's favourite thing too! she used to make animals with the girl next door, then eat them all. looking forward to meeting chris! Sam, I hope you have a really great time with you Mum! If Healdsburg is in your North of the City plans, shoot me an e-mail and I'll steer you towards some local spots. Have a great time with your mum! And I've got my fingers crossed that you'll have some yummy, post-frolick marzipan recipe up here in the near future . . .
Panting. Putting paper bag over head. Excited. Enjoy your family visit :-) I've been really enjoying your blog! oooooooooooooooo have so much fun! I hope you all have lots of fun. Lots of love. Happy Thanksgiving to you, Fred, and Mum! wow i home she has a good time! Have a wonderful time with your mum -- I remember her from your visit to NYC. I hope you have a gorgeous pre-holiday holiday together. And local almond paste? Wow. It's to be admitted that we Northerners are perhaps just a teeny bit jealous of all the local provender you folks can manage in California climes. I have to say that I take an awful lot of "Marco Polo" and other exemptions in our efforts to eat seasonally/locally. I comfort myself with the fact that if I'm acting with consciousness of what's seasonal and local, that too has a positive impact, even if I can't be 100%, or even 50% local all the time...maybe we just need to come take that much-promised trip to Cali and do some local eating there. You gotta love those Farmers Markets. Just went to our local one for the first time in ages and it has grown considerably and the variety and quality of the produce is fantastic. Hello Mum! I hope you're both having a splendid time, whether or not there is marzipan involved. Thanks so much for your comment on my blog and the link to Tea and Cookies (oh, no! another blog I'm going to have to add to my regular reading list--!!). Hope you had a wonderful visit with your mother. And what a great city to do it in.